This ornament seems to be a takeoff on the Wizard of Oz the clown is waving his hatFrom the Hot Air Balloon. The Clown is Emmett Kelly Jr. made of porcelain Bisque. Approx size is 6 ½ inches tall. Mint condition in the original box. 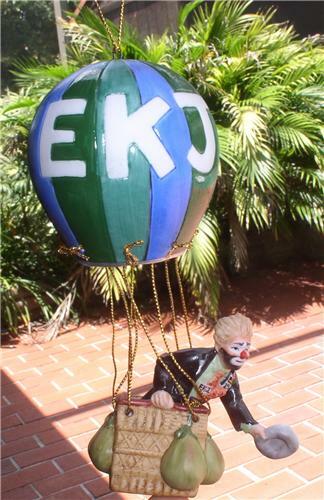 Emmett Kelly Jr. figure is inspired by America’s favorite clown. This was purchased out of an estate sale it is new, mint in the original box I have listed it as used because of its age. The box it comes in is showing it age it is not perfect!